Charles Lee Glenn Carr was born on August 10, 1967 in San Bernardino, California. The switch hitting speedy outfielder was drafted out of high school by the Cincinnati Reds in the 9th round of the 1986 draft. Over the next two years he moved to three organizations mostly due to his bad attitude. 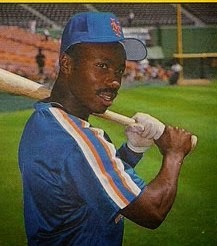 By 1989 he was with the New York Mets, stealing 47 bases at AA Jackson, but only hitting .241. In 1990 he made a one game appearance with the Mets in late April, filling in a quick roster spot going 0-1. Back at Jackson, he stole 48 bases in 93 games & was promoted to AAA Tidewater. In 20 games there, he hit .259 stole six more bases & was briefly brought up to the Mets big league squad again in August. He mostly was used as a pinch runner in two games, stealing a base against the San Diego Padres in a 2-1 Bob Ojeda win on August 25th. 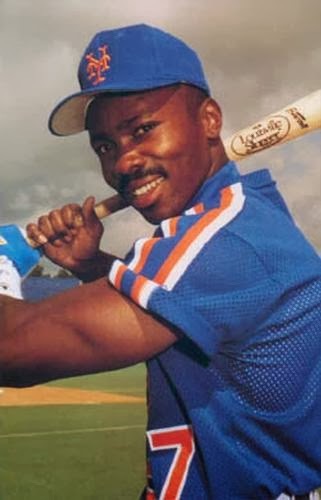 With the Mets, Carr first donned uniform #1, this just a season after Mookie Wilson had been traded to Toronto, he then switched to uniform #27. In 1991 he was up for two games in June, where he was used as a pinch runner stealing another base. He was sent back to AAA Tidewater but hit just .195. He was back with the Mets from August 16th - August 28th but hit just .182 on the year in 12 games. In December 1991 he was traded to the St. Louis Cardinals organization for a minor leaguer. From there he was chosen as the 14th pick of the expansion Florida Marlins. He became one of the teams first top players, as he led the NL in stolen bases (58) as well as caught stealing (23) batting .267 with 19 doubles & 75 runs scored. He played a centerfield as well & came in fourth in the Rookie of the Year voting. That was the Year Mike Piazza won the Award. 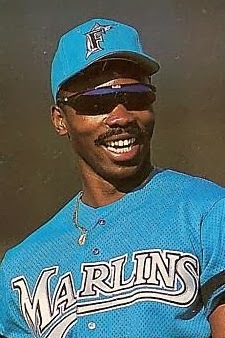 He would play outfield alongside Jeff Conine & Gary Sheffield the next two seasons, stealing 32 & 25 bases respectively. By 1995 he fell off to a .227 average & his attitude wasn't the most positive one in the clubhouse. In November of 1995 the Marlins signed free agent Devon White & the writing is on the wall for Carr. He is soon traded to the Milwaukee Brewers in exchange for a minor leaguer. On Opening Day 1996 he had a huge debut for the Brew Crew, hitting a HR, driving & scoring three runs in the 15-6 win at Anaheim over the Angels. His hitting fell off & he was still batting .274 at the end of May when he went down for the season with injury. While playing with the Brewers he was best remembered for popping up on a 2-0 pitch, after being given the take sign by third base coach; Chris Bando. Carr was leading off the inning, with Milwaukee down 4-1 to the Angels. The call came from then Brewer Manager; Phil Garner. When questioned Carr said " That aint Chuckies game. Chuckie hacks on 2-0." Carr was soon released from the team, at the time he was batting just .184. He finished the season & his playing career in Houston with the Astros that same year. In his eight year career, Carr batted .254 with 435 hits, 81 doubles, 7 triples, 13 HRs 123 RBIs, 144 stolen bases & a .316 on base %. He played in 484 games in the outfield making 28 assists with a .984 fielding %. Retirement: By 1999 he was playing in the Independent Atlantic League for the Atlantic City Surf. In 2000 he played for Bud Harrelson, who had been his manager with the Mets, on the Long Island Ducks. Carr later became a minor league coach in the Astros organization.